Processing: ~60 new boxes were created from unprocessed material. This concluded the work on unprocessed material. Collation: ~1100 boxes of material were collated. . When first processed materials were arranged alphabetically within each box, but materials from each organization remained scattered across multiple boxes (for example, materials related to the National States’ Rights Party are currently in boxes 2C, 3C, 4B, 7B, 12B, 18B, 21B, 23B, 26B, 29B, etc.). The goal for the collation process is to correlate all materials from an organization, then alphabetize the entirety of Part II so that, for example, the first box begins with “A Call to Resist” and the last box ends with “Zygon”. 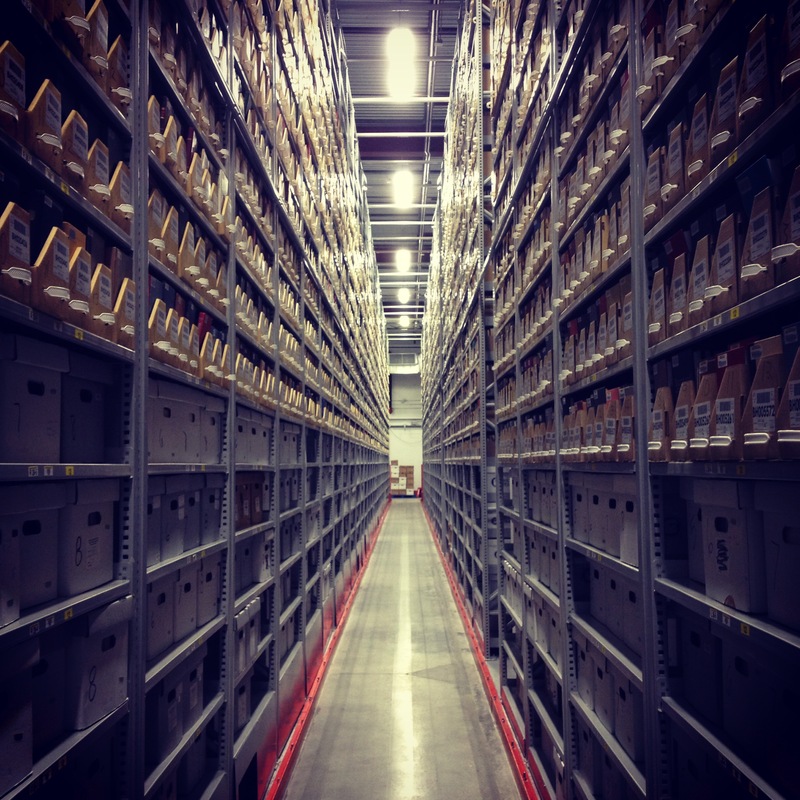 This is a critical step in processing the collection as it will eliminate the need for researchers to search for an organization in multiple boxes and will improve the ability of staff to guide researchers in use of the collection. Research: 1647 organizations have been researched by student assistants. They found a variety of information on the organizations including: locations, exist dates, biographical histories, related archival collections, organization members and variant forms of the organization names. Outreach: Announcements about the grant have been published on listservs and in printed newsletters. 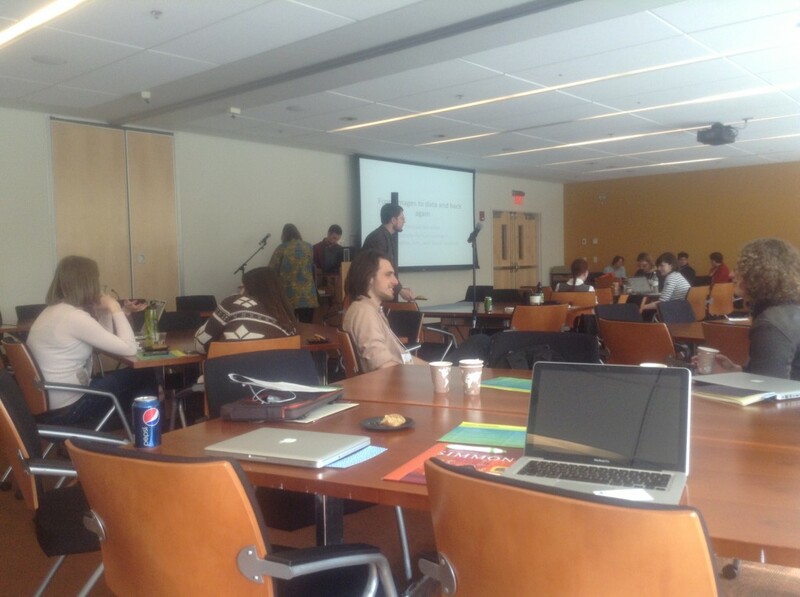 A blog has been created and updated at least once a week outlining the work done on this project and a presentation was giving at the DH:The Next Generation conference. 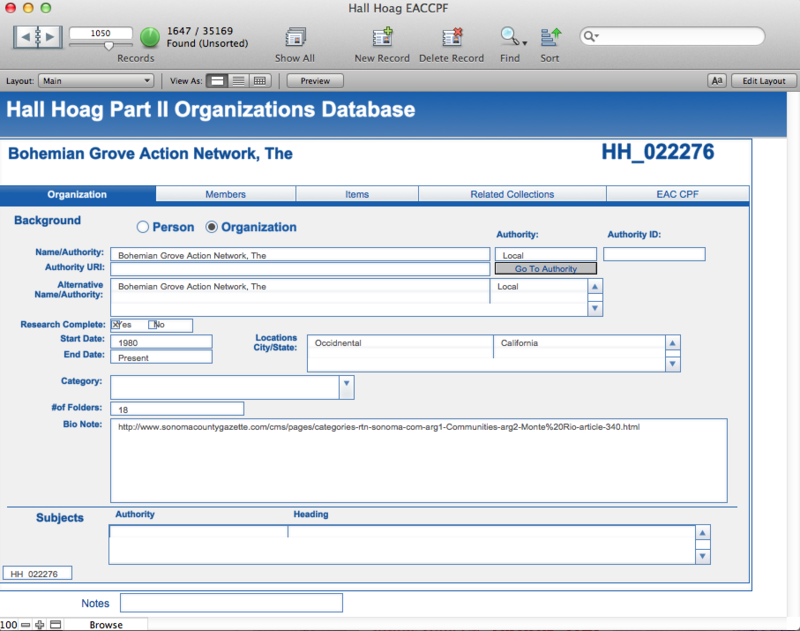 Organization Names: We created a list of 35,000 unique organizations in Hall Hoag Part II. To create the organizations list, we started with the inventories that were created when processing the collection, which, when combined, represented about 180,000 lines in an Excel spread sheet. Many of the organizations were repeated throughout the inventory and were weeded out using many automated and manual processes. EAC-CPF Standards: Throughout the first year of the grant the project team worked to set a standard set of minimum requirements for EAC-CPF records. Since there are 35,000 organizations in the collection and the goal is create an EAC-CPF record for each organization it was important to set a low requirement for data. Also, many of the organizations in the collection are obscure making it difficult to create robust EAC records. It was also important to set standards for the maximum amount of information to be collected. Some organizations are very well known and students/staff working on creating EAC records could easily spend too much time working on one record if standards were not created. EAC-CPF Tool: A tool was built using FileMaker Pro to create EAC-CPF records. The tool has been customized to automatically export valid EAC-CPF records for each organization based on the data that is entered. Fields include name, name authority, locations, dates, members, related archival collections and more. This tool will greatly increase the efficiency of creating EAC-CPF records. No coding will have to be done by staff at Brown. Students can be trained on how to enter data into FileMaker much more easily than they can be trained on EAC-CPF. This will allow more people to contribute to the creation of EAC-CPF records. The tool can also “export all” records in one batch. This allows us to make a wholesale change to the EAC-CPF coding (if there was a mistake, or an update needed). Rather than going through each record and making changes, they can be made and then exported for each record in a batch.